A rainy day in Honolulu and driving through Kaimuki I decided to drop by my old elementary school, Epiphany School. That’s right, a private church school which I attended K-5. Being a church school things were pretty strict here and I kind of used to think of it as like prison with a big wrought-iron fence that used to go around the church yard but now I see that it’s been removed which is quite nice. You have to been a regular member of a church with old Gothic type designs like this to really give you the feel for movies like The Exorcist and Damien. My memories of going to church services here is that it was like a dutch oven, hot as hell in there, I thought it would be more like heaven instead of heat like the other direction. It didn’t help that we wore robes and other stuff while in the choir and the Reverend Linscott was waving some urn thing around spreading incense smoke. I remember as a little kid sweating away, in my Sunday best and robes over that, looking up to two tiny oscillating fans on the ceiling trying to concentrate on whether or not I could feel any breeze, none could ever be detected. Of course being kids the favorite songs of me and my friends were Onward Christian Soldiers, musta been the army aspect of it all. Here are the classrooms of the school. Beyond the school is the H-1 Freeway which they were just finishing while I was in kindergarten and it was quite a noisy mess, I remember huge sheet of plastic flying around the area. 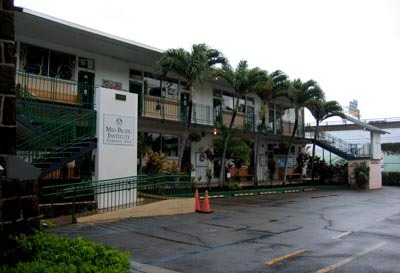 The school has been bought/merged with Mid-Pacific Institute which shouldn’t be much of a surprise. I never knew how this school survived, small classroom sizes and limited enrollment at the small campus. We didn’t even have our own play field, we walked over to Kaimuki Park to use their courts and ball fields. It was probably an unusual elementary school compared to public school. As a little kid during ‘nap-time’ the Reverend would play classical music on a phonograph and tell use the name of the musical piece and the composer, I thought we were supposed to be sleeping? The next day he would quiz us, he’d play some piece of music played in the previous days and ask if anyone knew what song it was and the composer. We were literally quizzed in our sleep! Also in school we learn poetry like Robert Frost and stuff like that. But I’ve always liked one poem I found in the poetry book as I procrastinated to learn what I was supposed to be memorizing. it hasn’t a feather and hasn’t a wing. it doesn’t fly it parachutes. Yep, I actually remembered that from elementary school (sure I also know some Frost but this was easier to remember). And yes, the author was listed as unknown in the book. It was an tough but in reflection interesting time that I had in school. In a moment of sanity my folks finally decided to pull me from Epiphany to attend public school for 6th grade. No doubt my grades were making them wonder why they were spending so much money sending me to private school. I once told my mom they should have sent me to public school, saved the money and bought me a car as a high school graduation present, she was a bit incredulous saying “but that’s where you learned to read.” I told her I probably would have learned in public school, plus I might have traded the squirrel poem for a car, ha. Now I found this sign a bit bizarre at the school when I visited. 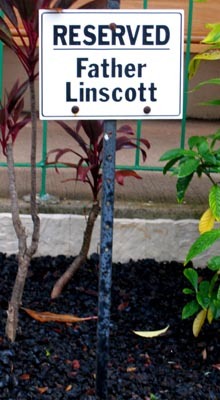 Father Linscott was the Reverend at the school when I attended, I’m pretty sure he’s listening to harp music by now so I’m a bit perplexed as to why this sign is there. Is it out of respect? Is there another Father Linscott at the school? 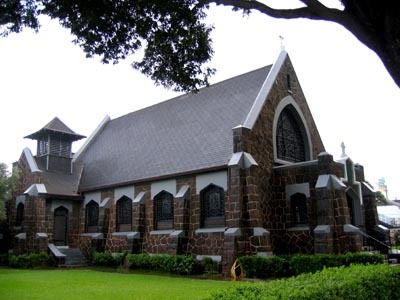 When I moved to Kona I found an interesting connection to my Honolulu roots. While having a chat with Sherwood Greenwell he said Linscott had been the Reverend at Christ Church in Kealakekua, Kona before he went to Epiphany. Sherwood noted that they had always had a reverend there but Linscott insisted upon being addressed as ‘Father’ like a Catholic priest. Strange how serendipity occurs. *UPDATE* Got the following email. I believe the man you refer to from your childhood (“Father Linscott”) is my great uncle. He’s still alive, believe it or not, residing in Honolulu. He was the eldest of three sons, and the last them to survive- must be the temperate Hawaiian climate. His two brothers (one of whom was my grandfather) spent their lives residing in their native Ellsworth, Maine. Though I’ve only seen him once (and that was briefly as a young lad), he occasionally sends my family gifts (especially for my young daughters, currently 6, 5, and 2). Well, anyway, thought you might find that interesting. Hey Baron, this is pretty humorous. I did sixth grade at Epiphany with Father Linscott so could relate to most of this. I was there in 66 when my father was stationed at Pearl. I do remember the long high Anglican services with the incense, the processional behind the cross, that along with the heat and heavy vestments, often made for a memorable and lengthy experience. That was funny about the music appreciation during nap time, and for my year there he actually did progressive muscle relaxation procedures which was an incredibly advanced idea for the time. I do recall serving as altar boy for, I think it was the Thursday noonish Mass thing, that a few older ladies tended to frequent. It was really intimidating as my church experiences had never involved as ornate a ritual as that. I went to ring the tower bell, three times each on the "Holy, Holy, Holy" part of the Mass, and yanked the bell cord so hard that the bell just spun and spun and spun, over and over and over. Well you can imagine it seemed like a really long time as I hunkered there in the bell tower with each gong hitting me like a sledge hammer. I was sweating bullets as I went back to the alter after the damn thing finally settled down and got down on the kneeler, peeking furtively at Father L, who had this quite humorless gaze fixed on me. From your previous correspondent it seems as though Father L came from New England and that seems to fit him in retrospect. Was glad to hear he is likely still alive, and I liked him quite well, despite his generally austere manner. Unlike you, I really valued the year I spent there and thought the education was a very good one, and that was owing entirely to him, as he taught everything. Thanks for the wayback machine Mr. Peabody.